Currently the 'home' of Falmouth Theatre Company, an unusual opportunity for a developer/building company to acquire this prominent site and design, obtain planning permission and construct a replacement building, the ground floor of which the vendor will retain and provide a 'cashback' for on completion of the building works, subject to contract and planning. 'Harris Rehearsal Rooms' is a non-listed former Methodist Chapel, occupying a prominent position in this sought-after area of Falmouth, 'above' the town, and from where fabulous views are enjoyed across the constant marine activity within the harbour, to Trefusis Headland and the deep sailing waters of the Fal Estuary, from the front elevation. In previous years, the property has traded as a nightclub with, we assume, the appropriate permissions and licences, long since lapsed. The current configuration provides an entrance lobby, adjacent to which there is a kitchen and off which is the main hall with existing ceiling height of 17'9 (5.42m) and balcony at first floor level. The main body of the building measures 31'9 (9.70m) x 38' (11.60m), in addition to which there is a later extension to the rear, currently a props room - 18'4 (5.60m) x 22'11 (7.00m) - off which there are toilet facilities and a side entrance/fire escape. Planning consent was granted in May 1996 for the conversion of the building into two semi-detached residential dwellings, reference: CI/PA02/0217/96/S. The vendors wish to negotiate a sale, subject to contract and planning, whereby the purchaser will design, obtain planning consent and construct a replacement building, within which the vendor will retain the new ground floor area for its continuing dramatic activities. 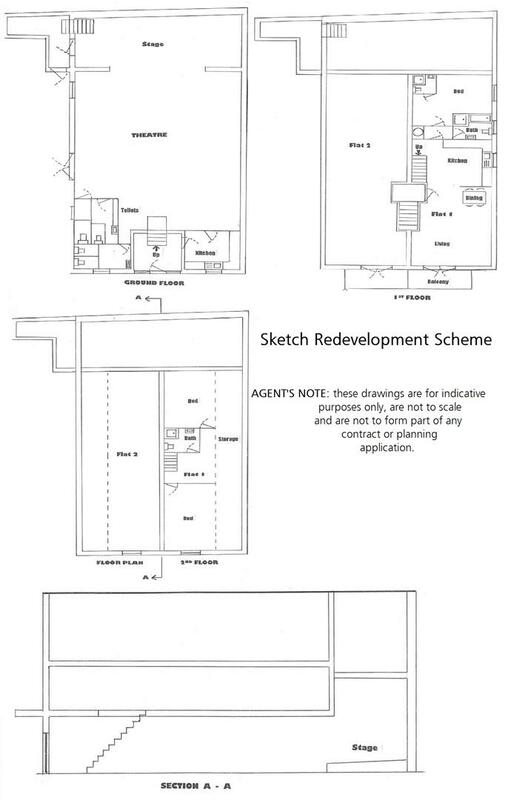 A sketch scheme (see below) has been produced, but interested developers/building companies will be encouraged to amend and reconfigure, subject to contract and planning. Offers In The Region Of £300,000 (three hundred thousand pounds) are invited, subject to contract and planning. On completion of the building works, the vendors will then provide the purchaser with a 'cashback' of a £Amount (to be agreed from the outset). The vendors will retain the freehold of the site with the purchaser acquiring a 999 year lease of the remaining parts. The freeholder and subsequent leaseholders will maintain the new building through the formation of a joint management company with relevant costs to be split on an agreed basis. We understand all mains services, including electricity, water, drainage and gas, are already connected to the building.